While the stigma associated with female hair thinning and loss makes the subject feel taboo, it’s an extremely common complaint. “There’s a misconception that hair loss in women is rare,” explains Robert Bernstein, M.D., founder of the prestigious Bernstein Medical Center for Hair Restoration in New York City. The truth is, 30 percent of women will experience some form of thinning. But there is hope. These six solutions help with thinning tresses at any age. Stylist and reality TV star Tabatha Coffey’s new line of wigs and extensions were created to add volume to thinning hair. The short, mid and long clip-in extensions are made from Keralon strands and feel exactly like real hair — you can even heat style them. They clip onto the top of your hair for a more natural look. It’s also the first-ever line of extensions to come in gray — three shades of it, as a matter of fact. Pantene scientists have partnered with the smart cookies over at Olay to conduct studies about female hair thinning. The result? 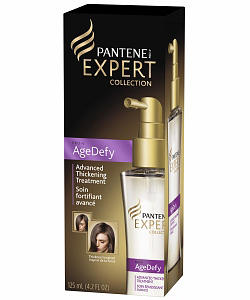 Pantene AgeDefy. This hair thickener, which contains a blend of caffeine, niacinamide and panthenol, has been shown to increase the diameter of existing hair fibers, so it’s as if 6,500 fibers have been added to the head. Bonus: After a month of use, hair becomes less brittle and more manageable. QUIZ: Do You Practice Good Hair Hygiene? YouBeauty Nutrition Expert Kristin Kirkpatrick, R.D., says that noshing on specific foods can actually help to create luscious locks. Wild salmon, tuna and trout are packed with omega-3 fatty acids that help to provide moisture to the scalp to prevent dry and brittle hair. Kirkpatrick also recommends foods that contain B vitamins to keep hair follicles in tip-top condition, thus decreasing the risk for hair loss. Fruits and vegetables, and beans and lean meat sources, such as chicken or turkey breast, are all great sources of vitamin B.
QUIZ: Are You Eating For Your Beauty? Dry shampoo does double-duty with this editors’ favorite product. 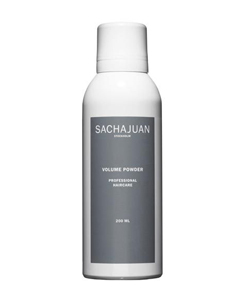 Sachajuan’s powder-based aerosol spray builds volume at the roots and dries with a matte finish creating the illusion and feel of fuller locks. Thicker-looking hair is only a shake and a spray (about four inches to be precise) away. Bonus: More time between washes! With a long list of celebrity and model clientele, this product is a 100 percent drug-free supplement containing a mashup of protein-rich cod, English whiting and shark. Sound nasty? Marine protein is known for providing nourishment for thinning hair and promoting existing hair growth from within. 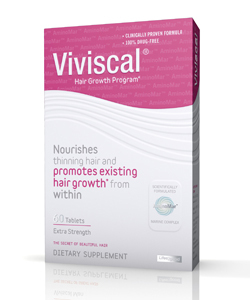 The supplement also contains zinc and biotin — two must-have nutrients for healthy hair. But patience is a virtue. Since supplements affect the hair growth cycle from the start, it takes at least three months (and possibly as long as six) to see results. Prescription drugs, like Propecia (aka: finasteride) help lower DHT levels in men, but is not yet FDA-approved for women. Some doctors do prescribe it to female patients, but it’s not recommended because of links to breast problems. In this same vein, over-the-counter Rogaine, with two percent minoxidil, can help with thinning hair if used consistently. In extreme cases, certain females are candidates for Follicular Unit Extraction Hair Plants — where the hair is removed directly from the scalp and grafted on to the thinning or balding areas.